Home>New Songs>Beast Coast Songs> Beast Coast Go Radio-Friendly On "Coast Clear"
Beast Coast switches up the style on "Coast/Clear." The "Beast Coast" movement is well underway, which is a notable accomplishment in itself. The fact that Joey Bada$$, Kirk Knight, Nyck Caution, Issa Gold, AK The Savior, Flatbush Zombies, CJ Fly, and Powers Pleasant have managed to clear their schedules and organize both a tour and an album is enough to signify the boys aren't playing around. Their initial single "Left Hand" set a vicious tone, picking up where former posse cuts like "Audiopium" left off, with brief verses and boundless energy. This time around, however, the Beast Coast players are pulling back, offering a more sedate, radio-friendly sophomore effort in the Powers Pleasant-produced "Coast/Clear." 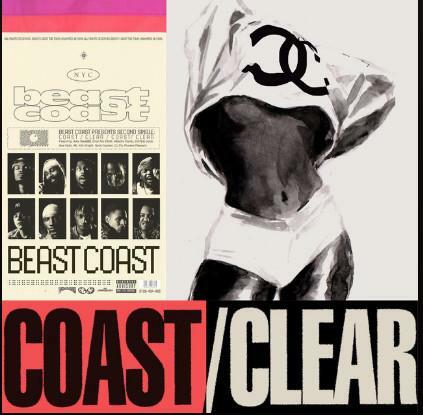 SONGS Beast Coast Go Radio-Friendly On "Coast Clear"